Kevin fell in love with sourdough bread on his first trip to Germany with the United States Air Force. When he and Erin bought their first house, Kevin built a wood-fired oven in their backyard and started whipping up delicious pizzas and breads. 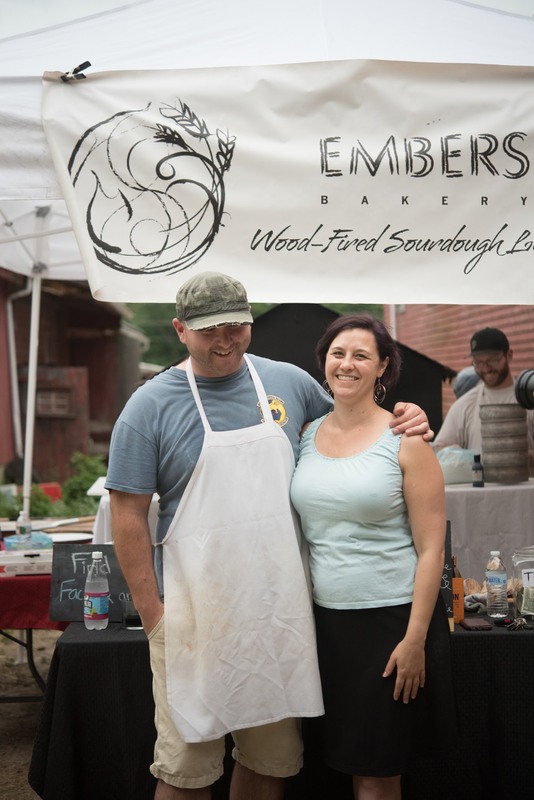 After apprenticing with Orchard Hill Breadworks and perfecting his bread recipe, Kevin got the idea to start Embers. After the Kickstarter campaign, Kevin got to work building the mobile oven. The genesis of Embers was truly a community effort– from the Kickstarter donors to the amazing deals from vendors to the friends and family who chipped in to help build the oven. We are grateful for all the help we had in getting this business on the road! Kevin still works for the United States Air Force as a boom operator and brings his talent to slinging gourmet pizzas on the weekends and baking bread for our Bread CSA members at Brandmoore Farm! Erin helps support the business in myriad ways– from helping to keep the books up to date to sourcing local ingredients and maintaining relationships with farmers to running the social media. Erin works as a food systems consultant and is thrilled to be contributing to the local food system and the community through Embers.